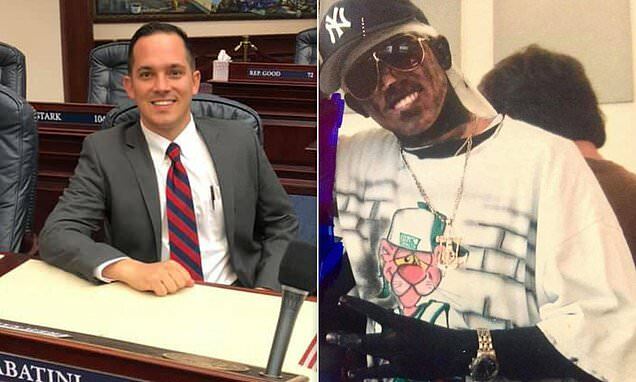 A Florida Republican state rep who blacked up in a high school photograph has refused to resign and says he photos were taken out of context after politicians called for him to get the axe. Anthony Sabatani is 30 years old meaning he was born decades after the Civil Rights movement of the 60s decried the racist caricature that enforced an idea that African Americans were hypersexual and cowardly buffoons. However he said Tuesday his image where he wore a basketball shirt and gold jewelry had 'zero' to do with other scandals in the past week that has revealed how other politicians deemed it okay to do so in the past. Sabatani said the move was 'decontextualized' and explained it was a prank he and a friend did when he was teenager at Eustis High School. The Howey-in-the-Hills man claimed his offensive image had 'zero' similarity to his Democratic counterparts who got into hot water recently. Although he could not speak for everyone who viewed the picture, his friend Brandon Evans attempted to quiet outrage at the millennial.